I joined Flickr over a year ago...and I love it! I still have a lot to learn, and I'm hoping you all can help me out. I wanted to share a few things I love about it and maybe get some input on some of the other things I should be using it for. I know there's a whole lot more I probably could be doing. The #1 reason Flickr is my favorite photo sharing (or in my case digital scrapbook sharing) site is because of the way my pages look and can be organized. It just looks so pretty! Take a peek at my Flickr page. It's just so pretty took look at with all those big, crisp pages. Take a look at how I have my albums organized. It's so organized. I love it! And it's super easy to share with others. 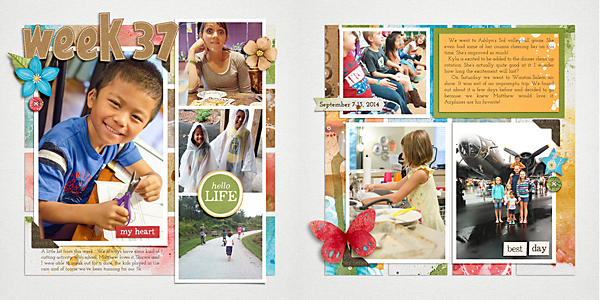 The #2 reason I love Flickr is because of the ease of uploading and sharing my photos to other digital scrapbooking groups. 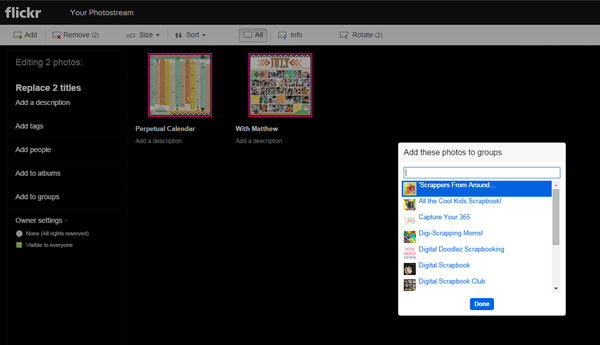 I can upload as many pages as I want, add the title and description, easily add the individual pages to whatever album I want to and then, with a simple click of the mouse, share those pages with other groups.....I don't have to upload to each individual group. Here's a screen shot of what the upload screen looks like. After I add the title and description, I can click on each page (notice the 'With Matthew' page has a pink box around it) and choose which album I want it to be a part of. Then if I want to add them to the different groups I belong to I can highlight all of my pages (just hold down 'Ctrl' as you click them all), and I can check the groups I want to share them with. You can also change the privacy settings on your photos when you upload them. 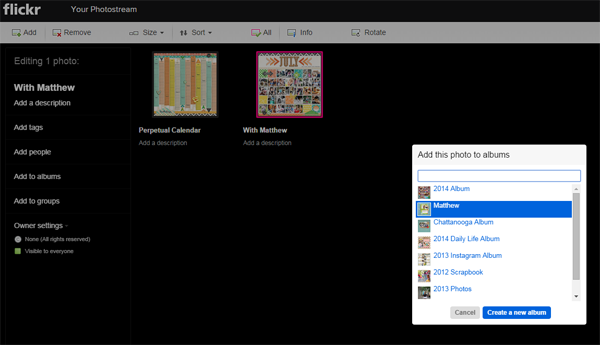 Some people also use Flickr as kind of a back up for their full-size digital scrapbook pages. I haven't gotten into that, but I definitely need to check it out. The #3 reason I love Flickr is being able to follow others. 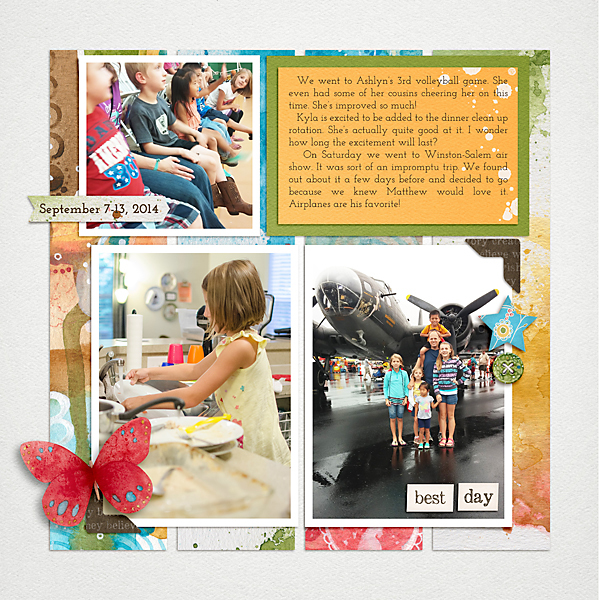 I can follow friends and fellow digital scrapbookers and see their beautiful pages. Now, I know there must be more to Flickr. Please share with me any tips I just need to know! I did so bad this week with taking photos. I don't know what my problem was. Two of the photos on my page were taken with my dslr, the rest were taken with a phone...most of them by my hubby. 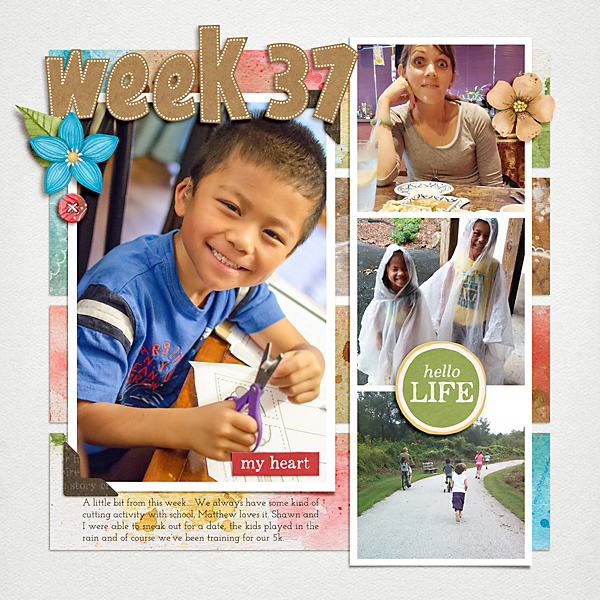 Oh well, the page is done, and I still captured our week. I will do better next week! Here's just a little reminder that these templates are super easy to rearrange. I had to rotate part of the second side of this template to work with my photos. I just rotated the photo and journaling spots and it was perfect for my portrait photos. 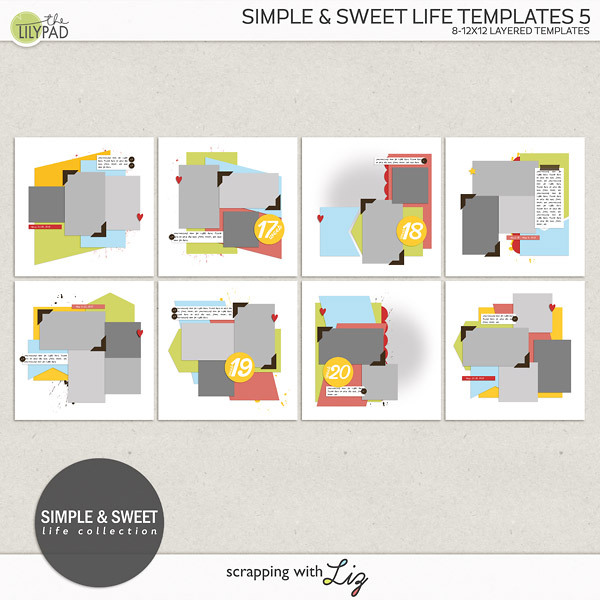 I have a bunch of template tutorials here that will help you rearrange and work with templates. Make the templates work for you! 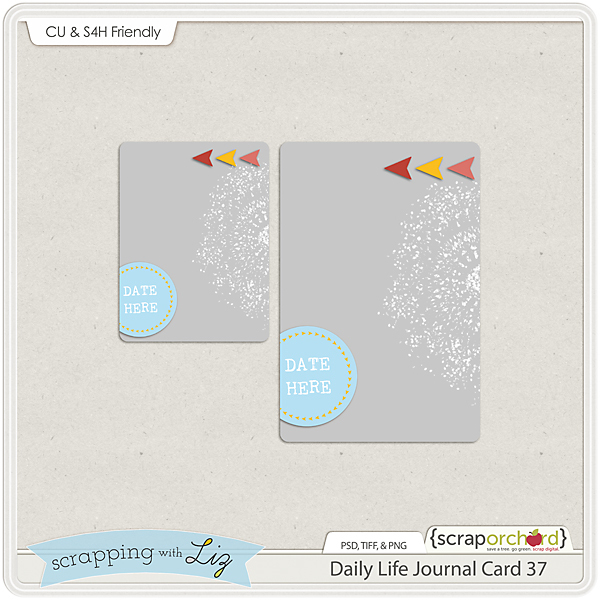 If you are interested in my week just take a closer look below, and don't forget to grab the free journal card template. 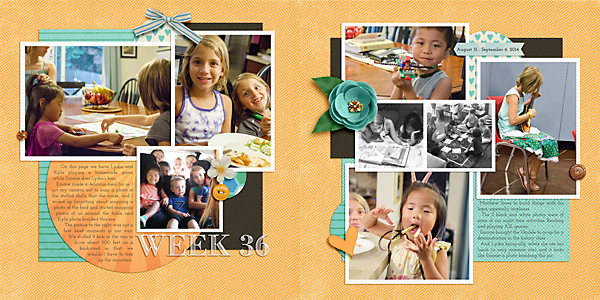 Journaling: A little bit from this week.....We always have some kind of cutting activity with school, Matthew loves it. Shawn and I were able to sneak out for a date, the kids played in the rain and of course we’ve been training for our 5k. 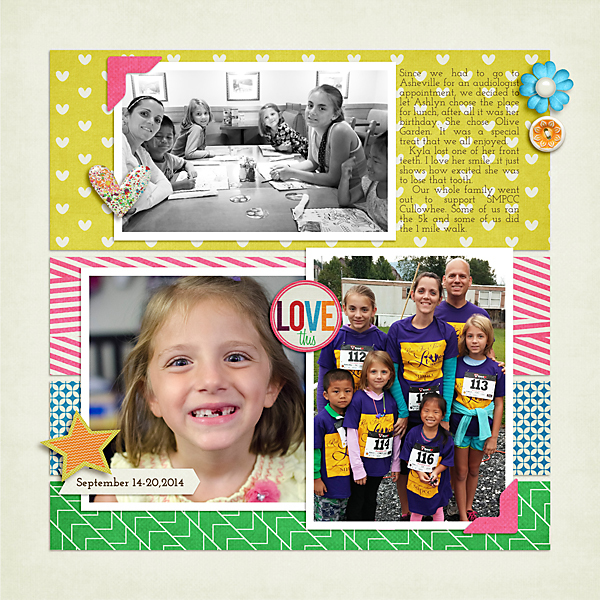 Journaling: We went to Ashlyn’s 3rd volleyball game. She even had some of her cousins cheering her on this time. She’s improved so much! Kyla is excited to be added to the dinner clean up rotation. She’s actually quite good at it. I wonder how long the excitement will last? On Saturday we went to the Winston-Salem Air Show. It was sort of an impromptu trip. We found out about it a few days before and decided to go because we knew Matthew would love it. Airplanes are his favorite! 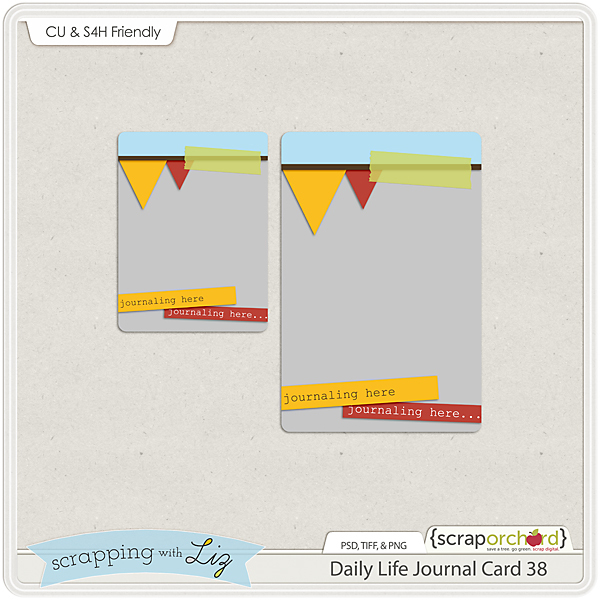 And here's your free journal card. I just love looking over my photos at the end of the week. After a long, hard week it is just what I need. Looking back at my pictures make me realize how blessed I am: 5 kids that wake up loving me every morning even though I don't deserve it, delicious food on my table 3x a day (well, mostly delicious), a home where we are making lots of memories, a God who loves me and a husband who makes me laugh (although I didn't even include him in this page!). Every Saturday night I look through my photos of the week and I'm reminded of why I do what I do. Look at those faces. Every hard moment is totally worth it. 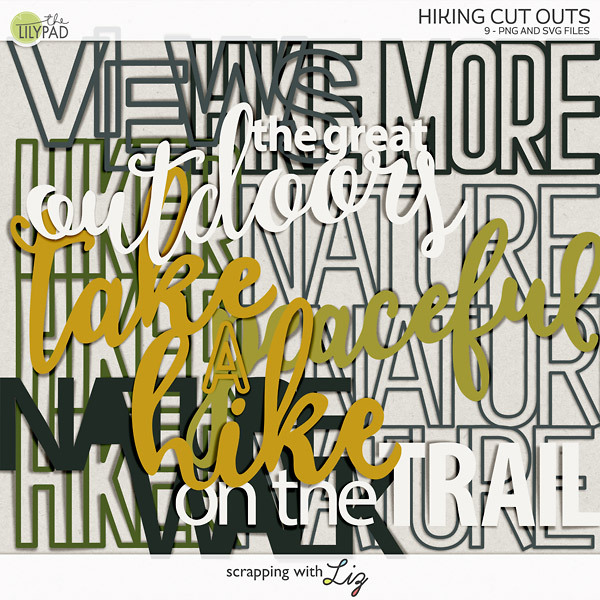 Now a note on my actual scrapping. 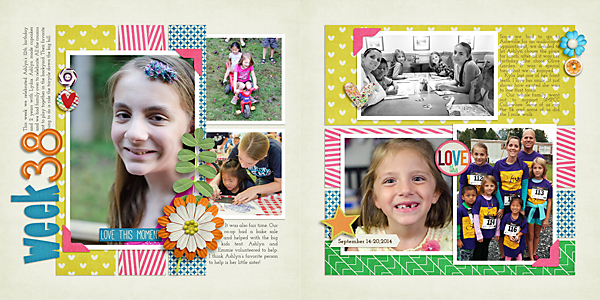 With this template I actually added an extra photo spot and adjusted a few photo spots to fit my photos (really, it's okay to do that!). I even used some not-so-great phone photos because they really showed a big part of our life (the B&W photos you see there). I made those photo spots a little smaller and made my photos B&W because the quality was pretty bad....but hey, they look okay on my page. Don't you think? You would think that since it's such a big part of our life that I would take better pictures. Sometimes you are just in the moment with your kids and you ask your husband to snap a photo with his phone. No time to go get the big camera...it would ruin the moment and then you would lose the photo and the moment. And you don't want to do that. I'll stop chatting and let you take a look at my pages. 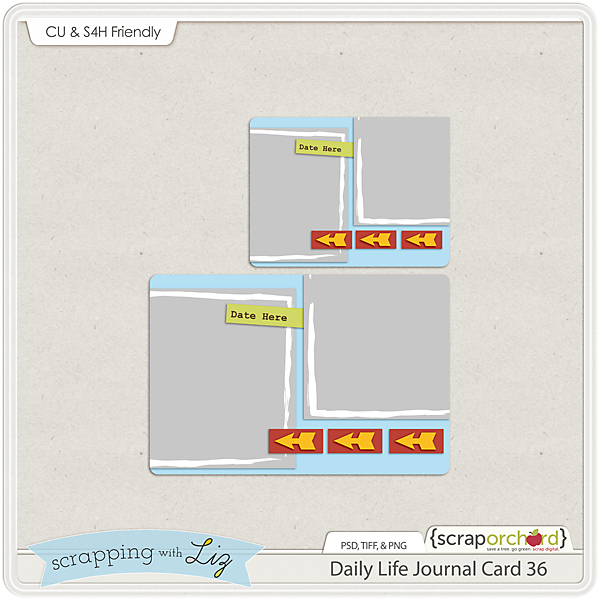 Don't forget to grab the free journal template below. 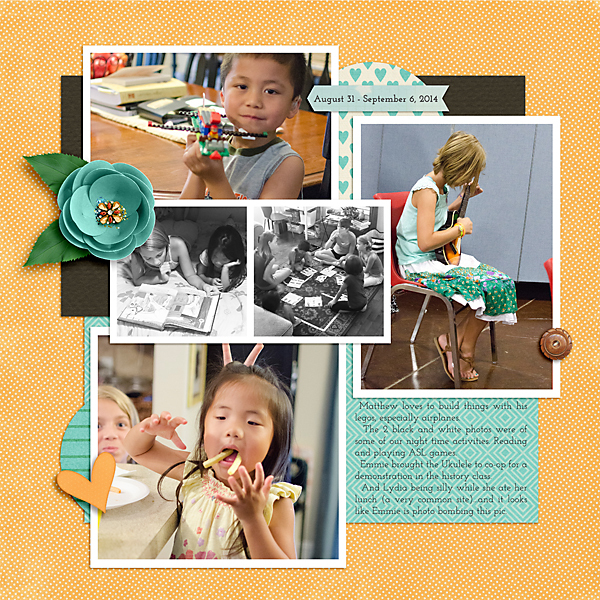 Journaling: On this page we have Lydia and Kyla playing a homemade game while Emmie does Lydia’s hair. Emmie made a delicious meal for us. I got my camera out to snap a photo of the stuffed shells that she made, and I ended up forgetting about snapping a photo of the food and started snapping photos of us around the table....and Kyla photo bombed this one. The picture to the right was just a few brief moments in our van. We stuffed 9 kids in the van to drive about 500 feet on a back-road so that we wouldn’t have to trek up the mountain. Journaling: Matthew loves to build things with his Legos, especially airplanes. The 2 black and white photos were of some of our night time activities. Reading and playing ASL games. Emmie brought the Ukulele to co-op for a demonstration in the history class. And Lydia being silly while she ate her lunch (a very common site)...and it looks like Emmie is photo bombing this pic.